Bloomington, IN: Indiana Univ Press, 1990. Paperback. Text/BRAND NEW & Bright. Illustrated soft cover/VG; w/light edge rubs, push to corner tips, faint creasing to lower front corner & upper back, and, slight bend to lower back corner pages from poor shelving. 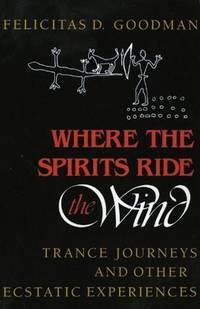 Documentation of trance experiences by Hungarian born anthropologist and expert in linguistic studies Dr. Felicitas Goodman (1914 - 2005) who studied the phenomenon of "speaking in tongues" and the effects of body posture as well as sounds on trances.. First Edition, 2nd Printing. Soft Cover. Very Good/None as Issued. Illus. by Gehard Binder (Illustrator). New York, NY: Holt, Rinehart & Winston, 1965. Text/bracketing to pg 6, else As New. Illustrated soft cover/NF w/faint vertical creasing to front & trace edge rubs. Park of Case Studies in Cultural Anthropology, Sanford Univ. Field work conducted between 1949 - 1953. Landlocked country in East Africa, British Protectorate 1894, and became an independent Commonwealth state in 1962. Ruled 1971 - 1979 by dictator Idi Amin. The society and culture described by John Middleton are no more; as a historical documentation of a way of life once was, the work is invaluable.. First Edition, First Thus. Soft Cover. Very Good/None As Issued. New York, NY: Holt Rinehart & Winston, 1964. Text/Near New & Bright. Illustrated soft cover/NF; strong & sound with faint edge & surface wear, and showing discoloration. PO name to fEP. Case study of Demirciler, a village of 60 houses, not too distant from Ankara. This treatise is based on some six years of field work, when the village primarily engaged in wheat farming and tended sheep and goats. Relatively insulated, the residents all shared the precepts of the Muslim faith and were further bound by a rich store of folklore and superstition; modern education was still absent. Written half century ago, the study is an excellent reference/resource for understanding the Turkey of today.. First Edition, 4th Printing. Soft Cover. Near Fine/None as Issued.